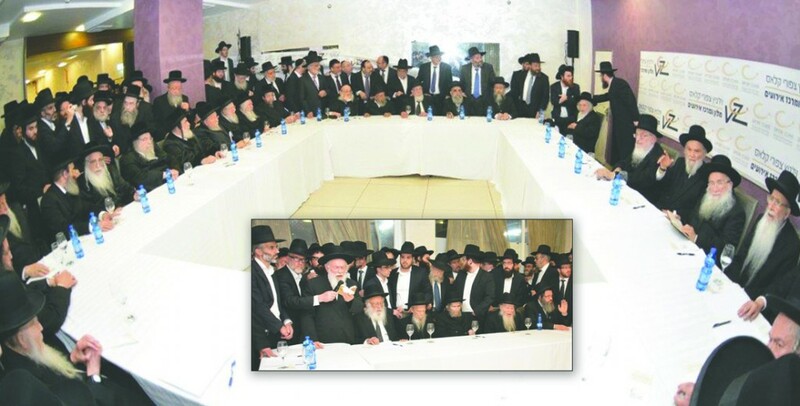 History was made last night when the leaders of the generation, the Gedolei Yisrael, shlita, of the Moetzes Gedolei HaTorah of Agudas Yisrael, the Moetzes Gedolei HaTorah of Degel HaTorah and the Moetzet Chachmei HaTorah of Shas, gathered together at the Vizhnitz Hotel in Bnei Brak for a joint meeting and consultation to address the harsh decrees being passed by the current government. The Gedolim denounced the concentrated efforts by the government, headed by Prime Minister Binyamin Netanyahu and with the cooperation of the coalition members, against anything that is dear and holy to Am Yisrael, namely the Torah and yeshivah world. A short time before the beginning of the joint meeting, the members of the Moetzes Gedolei HaTorah of Agudas Yisrael gathered in the home of the Vizhnitzer Rebbe, shlita, where they discussed the draft law at length, and spoke about the actions that need to be taken. Attending on behalf of the Moetzes Gedolei HaTorah of Degel HaTorah were Harabbanim Hageonim, shlita, Harav Aharon Leib Steinman; Harav Gershon Edelstein; Harav Shmuel Auerbach; Harav Aryeh Finkel; Harav Baruch Dov Povarsky; Harav Meir Tzvi Bergman; Harav Baruch Mordechai Ezrachi; Harav Moshe Hillel Hirsch; Harav Dov Yaffe; Harav Dovid Cohen; Harav Yitzchak Silberstein and Harav Yehudah Ades. In addition, the members of Moetzes Chachmei HaTorah, Harabbanim Hageonim, shlita, Harav Shalom Cohen, Harav Shimon Badani; Harav David Yosef and Harav Moshe Maya were present, as was Harav Moshe Tzadka. The meeting opened with the recital of Tehillim by Harav Yitzchak Zilberstein, passuk by passuk, for the recovery of Harav Shmaryhu Yosef Nissim ben Basya (Karelitz). After that, the Rosh Yeshivah, Harav Aharon Leib Steinman delivered piercing words. He said that there are three sins for which one must die before he transgresses them, and one of them is avodah zarah. He then cited Rabbeinu Yonah who writes that chillul Hashem is even worse than avodah zarah, and in our case, the draft law that seeks, chalilah, to throw Torah scholars into prison is a tremendous chillul Hashem, and everything must be done in order to annul this terrible decree. The Yeshuos Moshe explained that when there is “echad,” one, in the heart, that one’s actions are done solely towards Hashem, the One and Only, then one can receive the Torah properly. The Rebbe continued in a fiery tone, that if all of Klal Yisrael will unite, and decide one man with one heart, that we have nothing to do with them, and will no longer report to the recruitment bureau, there will certainly be a great success and we will be able, b’ezras Hashem, to win this struggle for the soul of Am Yisrael. Harav Cohen then expounded on the Torah revolution effected in Sephardic Jewry in the last generation, as tens of thousands have drawn closer to their heritage. The draft law hovering over us is liable to significantly harm families where many of the members do not even understand the terrible dangers of being drafted to the army, he said. “I know from our yeshivah several students whose parents want them to go to the army; they don’t understand anything. If their sons would not be cleaving to their Rabbanim, they would have gone to the army, and the Rabbanim are watching over them. If they don’t declare that there is no army at all, it will not work, chalilah. “Whoever comes to ask and consult me,” Harav Cohen said, “I explain the terrible dangers of the army and, Baruch Hashem, they have remained in the tent of Torah, but what will be with the rest of the families for whom the reports in the general media bring them to blur the borders, and their sons are liable, chalilah, to fall into the trap and enlist, even though until now, they were learning in holy yeshivah frameworks,” Harav Cohen said emotionally and then burst into tears. “The general media has a trend of depicting Torah scholars and yeshivah bachurim in a humiliating fashion, and it penetrates the minds of these families, and it is possible that this can have far reaching effects, especially as regards the draft, and that is why we have to value and respect the honor of Torah. He then called on the bnei Torah to increase their learning, and to strengthen their observance of mitzvos. “We will not let them take even one bachur out of yeshivah. We have to daven for them, that they do teshuvah and recognize the value of Torah, and that all the rest is trivialities. Someone who touches Torah is like he touches that which is most precious to Hashem, and he will not be cleansed. At the conclusion of the meeting, the secretary of the Moetzes Gedolei HaTorah of Agudas Yisrael read a statement signed by all the members. This article appeared in print on page 1 of the February 25th, 2014 edition of Hamodia.